With a brisk Westerly breeze Spellbinder headed out for the site known locally as the Cider wreck in the hope of finding some clearer water as well as gaining some protection from the wind. Things looked quite promising with the shot line remaining in view for some depth. On entering the water however it son became evident that below 6 metres lay a thick layer of plankton. Swimming down the light level soon dropped with very little visibility on the bottom. 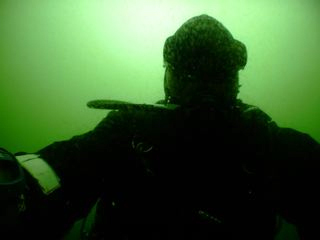 Nevertheless, the majority of the group pressed on, feeling their way around the wreck site. 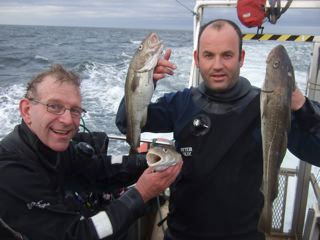 Trevor however used the poor visibility to his advantage as he demonstrated his prowess at catching cod by hand! Apparently Kevlar gloves are a must. In the end he returned back to the boat with three reasonably sized fish. Hopefully the coming weeks will start to see an improvement in diving conditions off the Tyne.